Before we examine the ancient monument that has stood proud for thousands of years secretly hiding the value of the ancient and future cubit in plain sight and see what else it reveals about our history and future, lets go back to the nature of the cubit itself: the splitting in halves of the double 55 to give us 27.5 inches. The Torah portion Vayera begins the 49th paragraph and 18th chapter of the Torah. It begins with the words Vayera Elav Adonai (VYRE ELYV YHVH), “God appeared to him,” of numerical value 290. And note for the moment that that this first chapter of parsha Vayera ends at Bereshit 18:33, which matches up nicely with the gematria value (1833) of the first half of the Shem Mem-Bet (42-Letter Name of G-d), whose mid- point is marked with the letters Resh-Zadi (RZ) of numerical value 290. Readers of The Genesis Prayer already know this RZ gateway, or connection, at the very center of the 42-Letter Name matrix and its relationship between this gateway the Well of Miriam (also of numerical value 290) and the blessing of conception and childbirth, but in this article we’re going to focus primarily on the secret encoding of the Torah as it applies to this miracle/blessing. Please note because it is not coincidence that there are 290 letters in the 4th paragraph of the Schema, the 1st of which has 42 words. Nevertheless, before we do, let’s take a step back to the prior weeks’ portion Lech Lecha (LC LC, of numerical value 50-50) the only portion named after one of the Torah’s mysterious 89 double (duplicate) words. In this portion, we find in the 45th paragraph of the Torah the Covenant of G-d with Abraham, the one that promises that his descendants will be as numerous as the stars, also know as the Covenant of Halves. 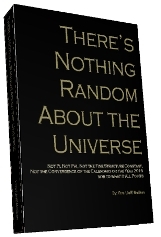 The readers of know full well that this event occurred, according to the sages of blessed memory in 2018 HC (see The Divine Calendar). Now it just so happens that this verse also contains a double word, Azir Azar (AZR AZR), the 17th double in the Torah, which is akin to the sum of the values of the initials of this portions first 3 words, (VYRE ELYV YHVH), 17. Morever, each of these double words contains the same Resh-Zadi (RZ) combination as in the center of the 42 Letter Name. We’ll get more into these mysterious doubles, but first the Torah is giving us some very practical spiritual advice if we want to conceive, even if like Sarah Amenu, we are 89 years old and born without a womb. In the verse just prior to this one, in 20:17, “Abraham prayed to God, and God healed Abimelech, as well as his wife and slave girls, so that they were able to have children.” In the very next verse, the first in chapter 21, Sarah is granted special providence by G-d to give birth to Isaac and begin to fulfill his Covenant with Abraham. The practical and simple advice is to pray for others to conceive if your desire is for yourself or your wife to. Now, it’s no coincidence that Isaac is conceived and born in the first 2 verses of chapter 21, just as the RZ combination in the Shem Mem-Bet is located at the 21st letter of the Name, the midpoint of the 42 letters. Keeping in mind that the ordinal value of the letter Resh is 20 and Zadi is 18, the last 3 words of verse 20:18, are Sarah, wife of Abraham, (SRH EShT EBRHM) and with the kolel their numerical value sofit can be either 2017 or 2018. Moreover, the next set of double words in the Torah is also in parsha Vayera, and they are “Abraham Abraham,” and not only are these the 18th pair of duplicate words, but the numerical value of Abraham is 248, the same as the Hebrew word for womb, rechem. We further note that these verses, all related to the RZ combination and to childbirth, are in the 4th reading of the Vayera Torah portion, just as the RZ is in the center of the 4th line of the Ana B’koach (42-Letter Name), the level of Netzach, which is associated with the energy of victory and perseverance. We’ll get more into the miracles embedded into these 89 mysterious double words as we get closer to Chanukah, not coincidentally also of numerical value 89, but for now, please note that the midpoint of these 89 words is the 45th one, Darosh Darash, connecting us back to where we began in the 45th Paragraph of the Torah and the Covenant of Abraham in 2018. Now Darosh Darash has the numerical value 504 – 504 and this location also splits the number of occurrences of the word value 504 into 25 and 25 per half, and while Darosh Darash is the 45th overall double, it is the 32nd unique one and the 32nd overall one just so happens to be CH CH of numerical value 25-25, representing not only the last two letters of Channukah (ChNVCH), but the date that the miracles of Channukah begin every year, the 25th of Kislev. Now, getting back to the occurrence of this hidden blessing for childbirth in 20:18 of paragraph 50 of the Torah, we know that 50 always represents the sefira (dimension) Binah and always connects to the 50 jubilee years prescribed in the counting toward Moshiach and the geula (final redemption), and that 49 chapters after the Covenant of Halves in chapter 15 of Bereshit we have the end of exile and exodus from Egypt. As part of that Covenant given in the year 2018 HC, G-d informs Abraham that his descendents will be in exile for 430 years and 2018 plus 430 years is 2448 HC, the year of the exodus, which just so happens to be 49 jubilee years (49 x 50) from Adam. And of the 89 double word pairs in the Torah, 49 are unique after discounting for repeats, leaving (89 – 49) = 40 repeated double word pairs, as in the 40 jubilee years from Adam to the Covenant with Abraham in 2018 HC. Then again there is the strange tale of Lot’s daughter getting impregnate by their father at the very end of paragraph 49. The descendant of that union many generation later would be King David, born 57.08 jubilee years after Adam., once again tying in the concept of childbirth and Mashiach. 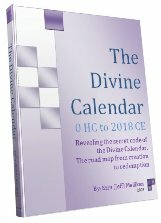 Of course, with the symmetry of the two calendars as illustrated in The Divine Calendar, Abraham’s birth in 1948 HC is analogous to Israel’s birth in 1948 CE, which is 5708 HC; and 2018 HC seventy (70) years later is analogous to the date Rav Ashlag gave us for the arrival of Moshiach and the geula in 2018 CE, or 5778 in the Hebrew calendar. And how does the 70 years play in to this? Moreover, of those 89 mystical double words, all of which help bring us miracles especially that of childbirth, 3 are in the 1st chapter of the Torah, 12 in the next, leaving 70 more plus the four (4) that spell out “Ani YHVH Melech, Amen” or I am G-d, King, amen.” This is analogous to the path of the Jewish soul, as explained by the Arizal, from the YHVH to Adam (of numerical value 45) to the 3 Patriarchs to the 12 sons of Jacob to the 70 family members of Jacob to the 600,000 to the fulfillment of G-d’s Covenant with Abraham in paragraph 45 to make them more numerous than the stars. And what does this all have to do with the 27.5 inch measure of the ancient and future cubit? Well, the 42-Letter Name is derived from the 1st verse of the Torah, which ends in Resh-Zadi (RZ) and because these are the 27th and 28th letters of the Torah, we have (27+28)/2 = 55/2 = 27.5. Moreover, 89 x 27.5 = 2448, as in the year of the exodus 2448 HC. As for how that relates to 5778, we’ll just have to wait until the next article on that ancient monument of stone. Meanwhile, tracing back to the first 3 words in Vayera–Vayera Elav YHVH, meaning G-d Appeared to him–we find that the middle word Elav, is repeated a short time later in the portion, this time with 3 dots over it, one of 10 times this occurs in the Torah, and we know from the sages that these 3 dots represent the 3 archangels that visted Abraham on the 3rd day of his circumcision—Michael, Gabriel, and Rachael—at the entrance to his tent. So not only are we being advised that if we persevere with our good spiritual intentions through our sufferings G-d will send us his angels, but with all the allusions to childbirth and to the arrival of Moshiach in 2018 CE, we are also being specifically advised to persevere with the right consciousness throughout the trials and tribulation of trying to conceive, and moreover through the next 9 years and the birth pangs of Moshiach. And while G-d will fulfill his Covenant in 2018 (5778) for those that persevere and maintain the proper consciousness, Bereshit 20:18 described the closing of the wombs for everyone who held Sarah captive. And amongst those 89 duplicative words, the word pair Taroph Toraph (TtRP TtRP) appears twice, the first time in paragraph 73 when Joseph was 17 and of the 49 unique pairs, this is the 17th one. The word means to ravage, tear to pieces, and its while the numerical value of the pair is 578, the gematria sofit numerical value of the pair is 2018. Go figure! Think about that. G-d set every word in the Torah for a reason. G-d set every word for a blessing. 89 of them he set twice. Maybe we should pay attention to them. Life is fraught with obstacles and suffering, but if we know where to look, it’s also full of blessings and the tools to manifest them. There are two halves to everything, the physical, represented by the feminine receptive letter Hey of the numerical value (5) and the spiritual represented by the masculine giving letter vav of the numerical value (6), together they add up to 11, as in the 11 unique letters in the Torah’s first verse and the 11 incenses that completes the 89 lights of the Menora within the sanctuary of the Holy Temple. We must also keep in mind, especially in the darkest times that there is a spiritual and a physical component to everything. Through that knowledge you will find the solution. Tonight is the death anniversary of the great kabbalist Abraham Azulai, may his memory be for a blessing and may G-d bless us all. A little while back, we were pointing out that many of the depressing milestones of Dow Jones in the latest crises fell on or the day after major Jewish holidays, and even advised to watch out for what would happen on Purim and Pesach (Passover). Well nothing remarkable happened concerning the markets on those dates, but Purim fell in 3/09/09,or as written in Mexico and the rest of the world, 9/03/09, the day little 5 year old Edgar became the first actual case of the Mexican (swine) flu. 903, as most of you know, is the small gematria value of the 42-Letter Name of G-d, where the antidote is hidden in plain sight. On this past Pesach, we recounted the 10 plagues and we told to remember the entire story of the exodus after the 210 years in exile in Egypt. We also know from the tzaddikim that the 10 plagues are destined to repeat in the end of days before Moshiach (the Messiah) in order to wake us up as they did our forefathers 66.6 jubilee years ago. He further explains that when delight (oneg, ANG) is of the selfish variety it gets spiritually converted to plagues (nega, NGA). What we need to do is reverse the process. This extends to all areas, but he was specifically talking about cleanliness (physical, mental, and spiritual ) in the course of sexual relations, and because of this, and because the source was water, a mikve of sorts must thus be engaged in the reversal process. And if you recall from The Genesis Prayer, and also from some of our articles, just such a spiritual mikve (ritual cleansing bath) is found in the very center of the 42-Letter Name (Ana B’koach), at the Resh-Zadi (רצ) combination, where the supernal waters of the Well of Miriam flow. We know of many couples who have used this spiritual (virtual) mikve to conceive righteous children, and others who have used it for ruach hachodesh (divine inspiration), but today we’re concerned with protecting ourselves from the enveloping pandemic that’s quickly blanketing the world, and this Resh-Zadi (רצ) gateway/mikve is only the preparation for the actual tool. To the true kabbalists the letters are tools to be permuted in the right combinations to unlock myriad gates of wonder. This one found in the heart of the 42-Letter Name is to help us convert plagues into delight by neutralizing them on a spiritual level. And at the heart of the matter, and the source of plagues is zarat Ayin,צרת עינ , jealous eye, also know as evil eye since our jealousy for one another causes evil to befall us and them, and prevents us from loving our neighbor as ourselves which is the key to reaching the tree-of-life reality, the reality beyond limitations that exists once we can perceive the 10 sefirot (dimensions). And we find just this combination of letters sequentially beginning with the Resh-Zadi (רצ) mikve combination. And oddly enough, the Name of G-d even provides us with clues so we don’t miss it. The word Bat (בט) is concealed twice within the middle of the 42-Letter Name and the word Bat (בט) in Hebrew means to look, see, regard, or to consider. And when we “look” what we see immediately following them the letters in zarat בטרצתג, and then right beneath them we have חקבטנע with the subsequent letter yud (י) on the next line giving us all three letters in ayin, thus giving us zarat ayin, “jealousy” delineated by the two bats (בט). And as in the first of the modern plagues, where compassion would have been the antidote to the housing and thus financial crisis, love is the answer here to, as the final letters in the sequence are gimmel-yud (יג), whose numerical value is 13 as in the Hebrew word for Love (ahava), which is also found in the middle of the 1st line of the 42-Letter Name, the line whose full value is 506, that of “unconditional love,” the real answer. And not coincidentally both those bats (בט) convert to gimmel-yud (יג) when one is added to the cipher. So let’s wake up, use the tools and find it in our hearts to actually love one another and begin to live the tree-of-life reality before it’s too late.